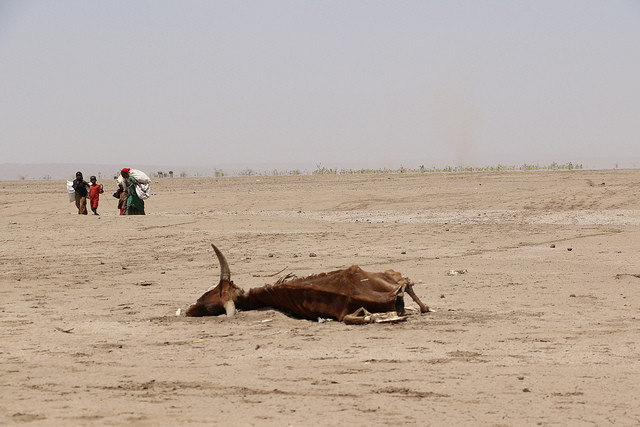 Ethiopia: EU boosts aid in response to El Niño drought. Photo by European Commission DG ECHO, via Flickr. El Niño events are a phenomena of natural climate variability with severe and global societal and environmental impacts. The impacts of these events include droughts and heatwaves in Indonesia and Australia, resulting in reduced food security and an increased risk of wildfires, and intense rainfall in Ecuador and Peru, leading to increased risk of major flooding and landslides. Within the ocean, warmer surface waters during El Niño events result in reduced fish stocks in the fishery zones of coastal South America and increase the potential for an intensity of tropical cyclones, particularly in the eastern North Pacific. Besides these impacts in and around the Pacific Ocean, El Niño has other, far-reaching impacts on seasonal precipitation and temperature patterns in many areas of the globe via teleconnections. For instance, the 2015/2016 El Niño event had severe impacts in Eastern and Southern Africa, including the worst drought seen in 50 years for some regions in Ethiopia and heightened food insecurity in Sudan. This nexus brief* explains the phenomenon of the El Niño–Southern Oscillation (ENSO) and details in particular the 2015/2016 El Niño event, which faded out in May 2016, but has impacts and effects on environmental and societal systems that will extend well into 2017. *Download the full text from the right-hand column. This publication is also available to download in French (see Further Resources). Key messages from the brief are provided below. Figure 1 from page 3 of the brief: Schematic representation of relative ocean temperatures and atmospheric circulation in the tropical Pacific during normal conditions (top) and El Niño (bottom) variations. This regular weakening of equatorial trade winds causes changes of ocean temperatures and atmospheric circulation patterns in and over the Pacific Ocean, impacting regional and global rainfall and weather patterns. Copyright: Australian Bureau of Meteorology. Source: International Research Institute for Climate and Society, Columbia University, 2014. El Niño events are natural variations of the circulation pattern in and over the Pacific Ocean, with strong impacts on the meteorological conditions on a global level. El Niño events cause intense rainfall over Ecuador and Peru, whereas at the same time unusually dry conditions prevail in Australia and Indonesia. In Eastern and southern Africa, El Niño induces droughts, while Central America and the Caribbean experience wet conditions. El Niño events have happened regularly over the past thousands of years. The first major El Niño event of the 21st century took place in 2015/2016, and faded out in May 2016. It is unclear whether or not El Niño variations in general will intensify in the future with a warmer climate, but it is expected that El Niño-induced rainfall will intensify due to increased moisture availability. El Niño events always have strong impacts on society. While direct meteorological consequences fade out after 12 to 18 months, secondary and tertiary impacts on food security and agricultural production extend into the following months and years, with cascading effects on livelihoods, health, water, sanitation, education and other sectors. The 2015/2016 El Niño affected over 60 million people globally. Figure 2 from page 5 of the full report: Typical meteorological impacts of El Niño events for December to February (top) and June-August (bottom). El Niño impacts and consequences often affect poor and vulnerable regions, people and communities. The immediate financial needs run to several billion US dollars. The political conflicts in Syria, South Sudan, Yemen and elsewhere in combination with the 2015/2016 El Niño event and related climatic extremes are putting an unprecedented level of strain on the worldwide humanitarian aid system in 2016. For the coming decades, in the course of continued climate change, an increase in extreme events is expected, independently of future El Niño events. It is therefore essential to shift from a reactive system with a focus on post-event aid and relief, towards a system of prevention, preparedness and adaptation, aiming at increasing the preparedness, responsiveness and resilience of potentially affected populations and societies. Efficient monitoring and early warning systems are of key importance for the reduction of the impacts of El Niño–Southern Oscillation (ENSO) variations. A main challenge is the establishment of effective communication of information available from operational El Niño monitoring and warning systems to targeted recipients. International policy documents provide an appropriate framework for the planning and implementation of actions for combating climate change and climatic extremes. The main task for involved actors, such as development and cooperation agencies, is to find suitable measures and feasible actions that are aligned with these global political frameworks on the one hand, and specifically tailored to the local conditions and needs on the other hand. Frey, H., Huggel, C. and Steinemann, M. (2016) The El Niño phenomenon and related impacts. Climate Change & Environment Nexus Brief. Swiss Agency for Development and Cooperation: Bern, Switzerland.